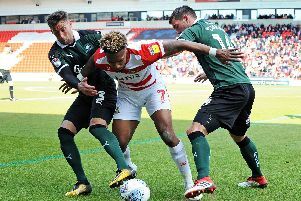 Doncaster Rovers boss Darren Ferguson has praised the decisiveness and positivity of recalled goalkeeper Marko Marosi. Marosi has impressed - and kept three clean sheets in four games - since replacing Ian Lawlor between the sticks last month. The 24-year-old had only made one league start this season prior to his surprise return to first team action against Fleetwood Town. His only black mark is the last minute challenge on Michael Smith which resulted in a match-winning penalty for Rotherham United in the recent South Yorkshire derby. “Marosi has come in and done well,” said Ferguson. “He’s shown good composure. He’s been positive. “He’s not the biggest Marko, but I feel with goalkeepers - and I’m fortunate because I’ve got two good young goalkeepers - it’s about being decisive. “Make a decision, be positive. “There was one [against Bradford City on Monday] where Marko came out and punched it, he’s made a decision and thought ‘right, I’m going for it’. “As a goalkeeper I always like that, rather than being hesitant. I think that spreads nerves around the place.